The right focus, at the right time, has enormous influence on top-line and bottom-line growth for any company, but it’s especially true for new ones. At the moment a company’s founders decide it’s time to add a sales team there are usually more issues to think about than who. “Sales” is used as a catch-all for a long list of activities and documentation that need to be rolled-out before the sales production line is running smoothly. Hiring a traditional salesperson first, before sales-support, and a marketing-driven lead-generation engine is in-place is a recipe for disappointment. Chief Marketing Officers and Business Development VPs must understand the evolution of effective selling techniques to identify skills and timing that will achieve the best results for their new company. Professional selling is about leading the customer to imagine how your product will improve their condition. Before there were Challengers: In the 1800’s through 1925, producers and collectors were recognizable personas of formal selling – also referred to as Hunters and Gatherers. Producers were the highly-compensated sales people who secured new business, while “collectors” were low-value operators assigned to gather fees and payments. In 1925, E.K. Strong published “The Psychology of Selling.” Strong formalized descriptions and methods to handle objections and focus on features and benefits. This approach stood until the 1970’s when research created SPIN selling (Situation, Problem, Implications, Needs). SPIN segmented customers by size and sales by product complexity. The approach was popularized by Neil Rackham’s book, “SPIN Selling.” By then procurement organizations were seeking ways to control costs through various negotiations frameworks. McKinsey & Company introduced the McKinsey 7S process and procurement embraced it as a way to vet suppliers. Contemporary sales thinkers, leaders, and sales trainers are driving high performance through programs based on the Corporate Executive Board’s research and 2011 book, “The Challenger Sale.” Written by Matthew Dixon and Brent Adamson it’s based on surveys from more than 1,200 companies about their B2B sales performance. 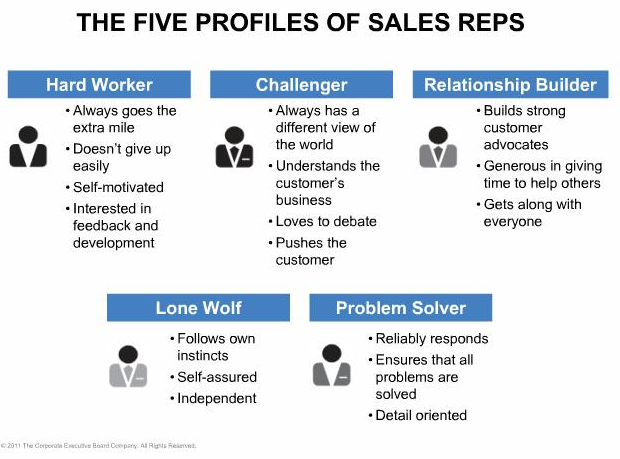 Dixon and Adamson identified five sales personas and their occurrence rates: The Hard Worker (21%); The Challenger (27%); The Relationship Builder (21%); The Lone Wolf (18%); and the Reactive Problem Solver (18%). They noticed that in low complexity sales, there was little difference between performance rates among the five types. But as product & service complexity increased Challengers separated from the pack as they generated a higher share of companies’ sales and profits. Challengers thrive: In complex environments with multiple stakeholders in the buyer’s organization. 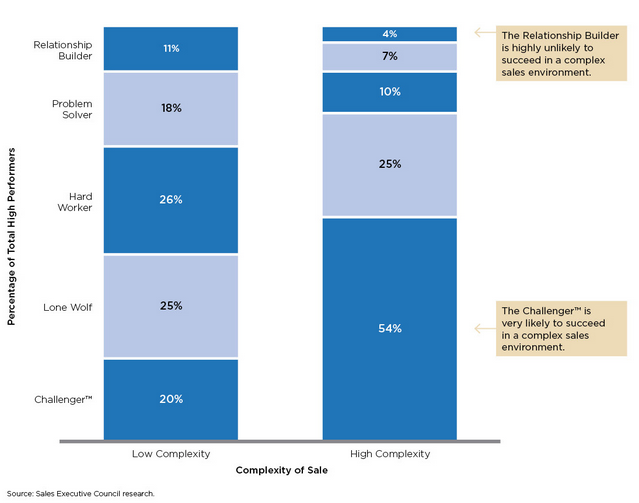 The Board’s research found that as product complexity increased performance separation began to favor Challengers over other sales personas. Here’s how Challengers do it. “A Challenger is defined by the ability to do three things – teach, tailor, and take control – and to do all of this through the use of constructive tension,” (Dixson and Adamson 2011). 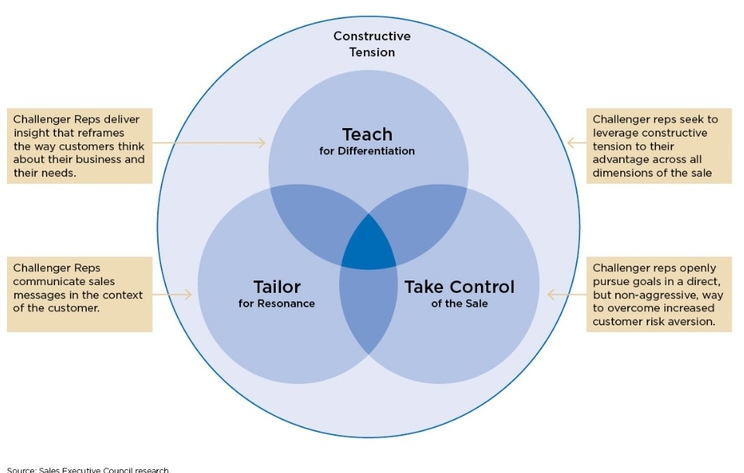 Teach, Tailor, Take Control – great news – it’s possible to teach other personas and mid-performers how Challengers apply those skills in the buying process. Challengers don’t tell – they create business partnerships to uncover meaningful insights; they see the world from the customer’s point of view and generate ideas to help them grow faster and more profitably. Challenger selling engages the whole organization to think about ways to generate value for customers. Simply put, the Challenger method can be learned. 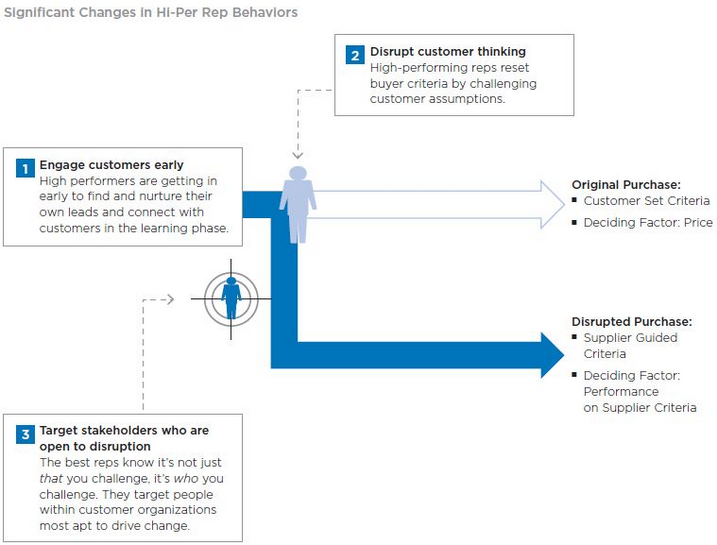 The trick is to understand the mechanisms Challengers use to manipulate the buyer’s path. Marketing automation: The arms race between sales and procurement has been accelerating. Contemporary marketing automation strategies, enhanced through lead-scoring programs offered by Act-On, Hubspot, Pardot, Infusionsoft, and others, are force-multipliers that allow sales and marketing organizations with a few employees to close complex deals with large customers, faster, at a higher-rate. It doesn’t take an active imagination to realize what a Challenger could accomplish if they were handed a list of prospects who poked around the company’s website, viewed pages with information about implementation schedules, and opened a pricing page multiple times over the previous four days. Marketing automation is a goldmine. Want to see it in action? Download the beacon viewer extension from ghostery.com, once it’s active on your browser visit your competitors and other leading companies’ websites and check out the tools they’re using to track visitors. Summary: For CMO’s, finding someone who understands the customers’ business and has the bandwidth to position the seller’s products in a meaningful way, earlier in the decision-process, will make a big difference to their new organization’s success. And if you don’t need a Challenger, you might not need a sales team. Sales people cost far more than sales and marketing automation programs, so a solid plan that incorporates both is necessary to drive success from each. A Challenger mind-set, along with a comprehensive list of lead scores from the new company’s prospective customers creates a good starting point. Identify customer personas, and determine those customers’ “consideration paths” to buy your products, then organize content to respond to what you already know. Launch your website early to accrue benefits the Google search algorithms bestow for site age. Focus on meaningful, relevant content to drive participation on your site; refine your meta tags, keywords, and messaging to achieve low bounce rates, and increase visitor times on-page to drive higher organic search results – read “Call to Action” Bryan and Jeffrey Eisenberg’s e-commerce classic if you don’t know what this means. Hire a good marketing person to create and publish sales collateral, marketing materials, and develop content that buyers will exchange personal information to get their hands on. Launch a marketing automation program to capture buyer interest and develop a sales pipeline. Now you’re ready to hire a Challenger sales leader. Productivity is a catalyst that boosts self-confidence. Several months ago I sat next to Jason Womack on a flight to Los Angeles. In his book, Your Best Just Got Better, Jason describes strategies to become more productive. I adopted several immediately, but he also pointed out the need to understand why we do what we do, to do more, or to eliminate it from our lives. As a career coach I frequently encounter people who have the skills and experience to tackle any job in their field or profession, but they’re missing a key ingredient. Self-confidence. Only view emails once I’m prepared to respond to them. I’ve lived long enough to know my flaws – and peak performance requires down time and an adjustment period to reflect, rehearse, and wind-up before I walk into a client meeting. I tailor each discussion to the customer’s needs; I challenge their approach to create tension and demonstrate proficiency; and I teach them how my products will drive their business. All of this gives me control over the buying process to steer ideas and decisions into my strengths. This is why I want to be on the ground a day before meetings with International clients. For me, there’s too much at stake and too much to lose…even if same-day travel flows smoothly it diminishes delivery preparation. Favorite clothes / clean – pressed. Coffee / dressed / groomed. Electronic devices powered up – power adapters available. Itinerary / schedule / map / transportation options. Site reconnaissance – visit the office before your meeting to determine how long it will take to get there. ID / passport / currency. Data and voice active (mobile phones while traveling). Glasses / contacts / supplies / medications. Local knowledge about tipping, credit card useage, other customs. Hardware has network connectivity / back-up plan if network is unavailable. Thank you cards – Always Be Ready. Be productive during delays – see above. Treat yourself to an airport spa or airline clubs when traveling. Use the arrivals lounge for a shower / fresh clothes. If the day matters – upgrade yourself to a suite. The space will make you feel better and injects confidence. I hope this list triggered ideas to put you in the right mindset. Here’s one to end on and it’s worth repeating. “Don’t review emails on your cellphone until you’re ready to take action.” Adopting that best-practice has eliminated anxiety from my routines so I stay focused to make my best even better. How much carbon dioxide does an airplane create? Here’s the equation: 2 C8H18 + 25 O2 -> 16 CO2 +18 H20. Each gallon of JP8 – Kerosene – or jet fuel, weighs about 6.5 pounds. A gallon will combine with 23 pounds of Oxygen and generate twenty pounds of CO2. In practical terms wide-body flights on long haul routes will generate their take-off weight in Carbon Dioxide. Here’s the detail. First, jet fuel, or Jet A, or JP8, contains a blend of different carbon-based molecules that combine with Oxygen to generate heat and pressure that jet engines convert to thrust. For simplicity, I’ll ignore the blend, and assume that “Octane”, a string-like molecule that contains a backbone with eight carbon atoms and eighteen Hydrogen atoms along the sides and endcaps, is a good proxy for everything else in the gas tank. During the combustion reaction, each carbon atom will combine with two Oxygen atoms to form Carbon Dioxide (CO2), while the Hydrogen will also combine with Oxygen, but their marriage yields water (H20). The reaction balances when two Octane molecules react with twenty-five Oxygen molecules (O2) which contain two Oxygen atoms. The exhaust product contains sixteen Carbon Dioxide molecules and eighteen water molecules. Here’s the equation again: 2 C8H18 + 25 O2 -> 16 CO2 +18 H20. This detail isn’t useful until we convert molecular weights and ratios into terms that people are more familiar with. We know jet fuel weighs about 6.5lbs per gallon, and that mass is 81% carbon. We already know that our Octane molecule will split to form water and CO2, but the result most people struggle with is the conversion to weight. Specifically, Oxygen is heavy, about a third heavier than Carbon, so when each Carbon atom combines with two Oxygen atoms, the resulting molecule, CO2 is four times heavier than the Carbon atom by itself. This means each gallon of jet fuel (6.5lbs) will combine with 23lbs of Oxygen and turn into twenty pounds of CO2, and just over nine pounds of water! How much CO2 does a Boeing 777-200 create on a flight between Chicago and Hong Kong? Let’s work through it – fuel is a liquid, and measured in gallons, but the exhaust is a gas, that’s why we use weight rather than volume to describe the output. 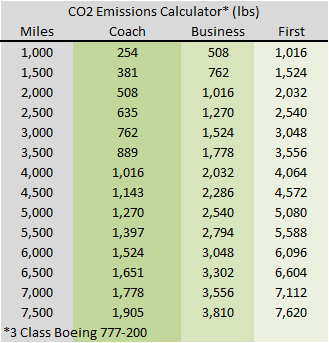 I calculated the 777-200’s gas mileage in a previous post that compared a Boeing 737 against a Toyota Prius. At .1836 miles per gallon, a 7,821 mile flight needs 42,000 gallons. The flight would generate 851,000lbs of CO2. That’s 30% more than the maximum takeoff weight on departure, including the plane, fuel, passengers and cargo. The table below contains a comparison among cabins and shows passengers, fuel burn and CO2 emissions. Now that you have information about how to calculate the CO2 emissions for an entire flight, we need to add more information to break this down to the seat level. Previously I calculated the fuel burn per seat to provide a table that shows how much the fuel costs per mile for each cabin and at various price points for fuel. That’s a good starting point, but this time the data table will display how much CO2 an international flight would create for different distances and cabin. See below. The Boeing 777-200 offers a useful snapshot of the likely performance other aircraft could achieve. It’s a good benchmark because it’s currently in production and it’s flown on transatlantic, transpacific and intra-Asia flights. However, the design requirements for long-haul international flying require twin aisles, more lavatories, large galleys, more storage space, life rafts and a host of other overhead not needed for shorter hops. These factors make it useful to perform a similar calculation to offer information about CO2 production from more efficient single aisle aircraft in use on short hauls and for domestic US flying. In this case, the 189 seat, all coach, 737-800. 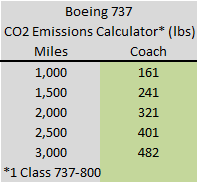 A comparison between the 737 and 777 coach emissions levels demonstrate that the smaller aircraft is more than 55% more fuel efficient when using numbers normalized for total seats. When you measure efficiency on a blended basis across all cabins the total difference is higher, that’s why it’s important to have separate tables. These tables offer you a quick resource to answer questions about the carbon footprint your travelers leave behind each trip. Update: the verdict is in – Captain Schettino is sentenced to sixteen years in prison for a disaster that cut 32 lives short. Here’s an interview with survivors reacting to the sentence from NBC. This is a look back at the Costa Concordia during a two-week period when commercial transportation gave the media a lot to report on. AirAsia lost an Airbus A320 with 162 people onboard in the Java Sea. The Norman Atlantic, a ferry, suffered a fire on the auto deck off the coast of Greece enroute to Italy, while two other ships, the Ezadeen and the Blue Sky M, carrying over 1,000 refugees, were also abandoned to the Italian Navy. 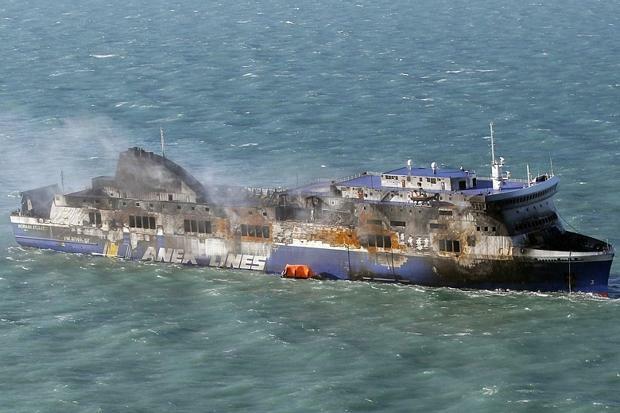 Days later the Hoegh Osaka, a car-carrier, ran aground off the Isle of Wight; the Cemfjord sank off the coast of Scotland – without a trace of the crew. A Norwegian carrier, the Bulk Jupiter, left one survivor from a crew of nineteen when it sank off the coast of Vietnam. The Norman Atlantic had 478 passengers on the manifest, but it’s still unclear how many people were actually on board. No alarm sounded, and many passengers were alerted by other passengers, or the acrid smoke in their cabins. Once on deck they were greeted by pounding rain, water from cannons used to fight the fire, and forty-knot winds. Survivors were lifted to safety in rescue baskets from Italian Navy helicopters operated until the ship was emptied. Although more than ten people died, Norman Atlantic survivors were fortunate. The ship remained afloat throughout the rescue operation – not the case for passengers on the M.V. Sewol. The MV Sewol sank off the South Korean coast on April 16, 2014. 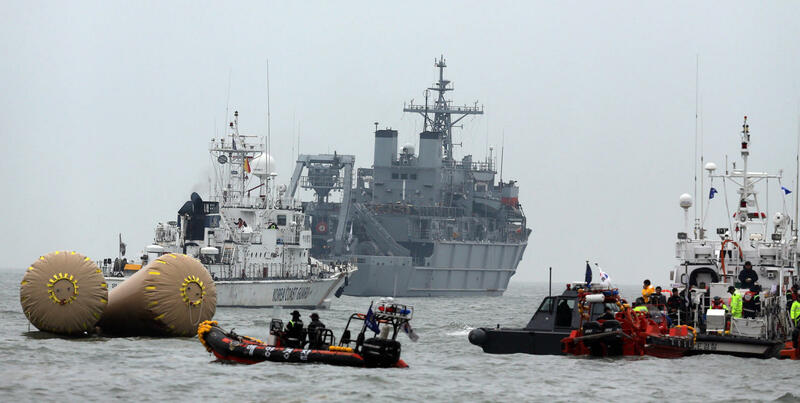 In that tragedy, hundreds of Korean school children were told to put their lifejackets on, but remain where they were inside the ship, to avoid increasing a list created by a sharp turn commanded by the crew. Incredibly the ship’s Captain reinforced the order to “stay put” even as he abandoned ship. Most of the students were found in the cafeteria when divers searched the ship in the days following the disaster. Now, Captain Lee, and eleven of his crew are facing murder charges in South Korea. Traveler deaths in ferry and shipping disasters are far higher than those from commercial aircraft accidents. There are too many examples where crew-member instructions doom people who, left on their own, would have saved themselves. This is true for the next story too. As they passed close to an Island off the Italian coast passengers felt an impact and sought direction from the crew. Earlier that day Steve reviewed safety materials in their cabin ​and noticed lifeboats were mounted on Deck 4, but now the crew instructed passengers to muster on Deck 10 and to don life-jackets. Blake and Steve were already ​on deck 7, but ​had ​a nagging feeling that a ship that size shouldn’t have a recognizable list so quickly. Something was seriously wrong, and they both thought the crew should be sending people to the lifeboats. After a long delay they decided it was time to go, and without grabbing cellphones or jackets, left their cabin and moved against the crowd on the quiet ship to find the lifeboats. On the fourth deck it was obvious lifeboats would be deployed – and many without enough passengers to fill them. Blake and Steve boarded the closest one. Within minutes they were told to get out since the lifeboat couldn’t disengage from the heavily listing ship. They moved to another boat​ and bumped along the side before falling the final 30 feet into the ocean. In the water they saw people in a small raft who had jumped from the ship, and they watched as more lifeboats were lowered. ​Unfortunately, by the time abandon ship was called an hour after the disaster, lifeboats on the Port side, the high-side, ​could not ​swing free of the ship and lowering them safely ​was impossible. An accident in open-water might have had a different outcome. 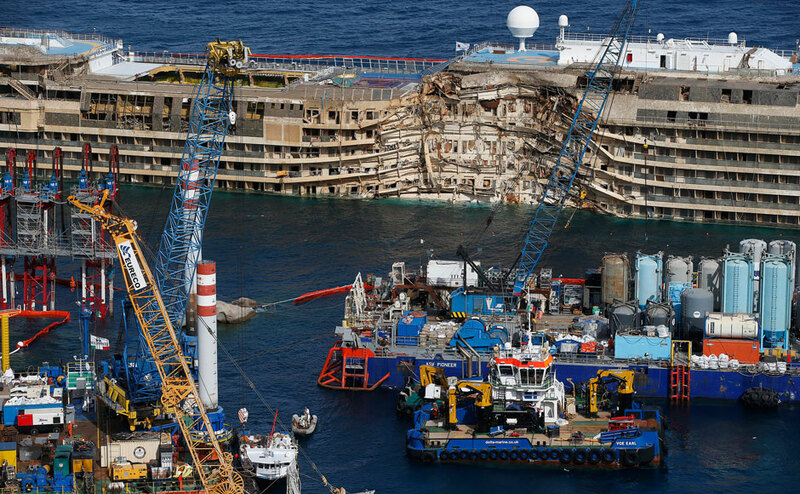 When the Costa Concordia rolled onto it’s side, the island prevented it from sinking. Blake’s experience demonstrates how powerful intuition can be to save us from harm. He and Steve overcame self-doubt and denial, but they also ignored ill-informed instructions from the ship’s crew. Those were two powerful forces working against them – conscious denial slowed their progress towards the lifeboats, even as intuition told them they were in danger, but the crew slowed their self-rescue too. Authority figures gave them the wrong instructions. Blake’s skepticism, and a wind that caused the ship to shift to it’s other side convinced Blake that it was time to go. Steve was already there, but their actions demonstrate that when our conscious brains, and authorities take over, we can be slow to take life-saving action in our own defense.